Trump Tracker: Will Ohio Officials Take a Stand? It’s been clear for a while that Donald Trump is unfit to serve as Commander in Chief. But today we arrived at the point where it is no longer acceptable for any legitimate candidate for office in this country to stand on the sidelines and allow — let alone assist — this man in his quest for office. This is either a call for assassination of a future president, or it’s a call for armed insurrection. It’s definitely not a call for unity, as the campaign’s laughable mop-up efforts suggested. Some high-profile Republicans have taken a stand. Most notably, Senator Susan Collins of Maine has said that she cannot support Trump for President along with 50 former Republican national security officials. But Ohio’s most prominent Republicans are playing a dangerous game of footsie with this maniac. Starting now we aren’t going to let them fly under the radar. Our newest feature will track the positions of Ohio’s Republican leaders. Eventually we will expand this list to include GOP members of Congress. 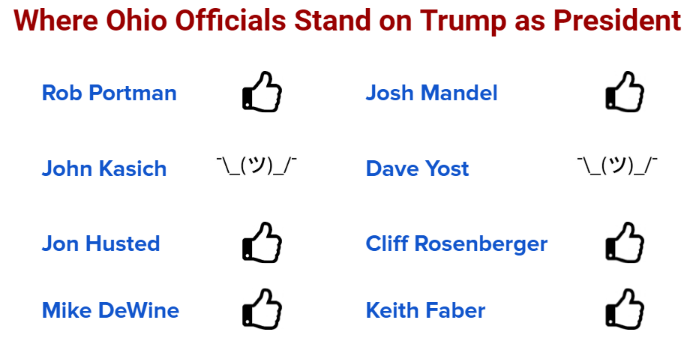 If you have information on where House members stand (did they show up at a Trump rally? That’s support! ), please let us know so we can hold them accountable. Tweet us at @plunderbund. Dems Contrast Clinton Economic Plan With Trump ‘Monopoly Money’ Plan Proposed RNC Petition To Dump Trump? Is This Kasich’s Last National Chance To Lead?